Clement C. Moore was a professor at the New York City General Theological Seminary of the Protestant Episcopal Church. He is most well known for his poem “A Visit from St. Nicholas,” which helped establish the character of Santa Claus. He died in 1863. Amanda Brack is a freelance illustrator who loves dogs of all shapes and sizes, old horror movies, and homemade smoothies. She spent most of her childhood with her brothers constructing expansive LEGO towns and fighting over the best bricks. She graduated from the School of the Museum of Fine Arts and is currently living near Boston, Massachusetts. The Night Before Christmas by Clement C. Moore is an awesome book for kids! The illustrations are so fun and match the words on the page perfectly. 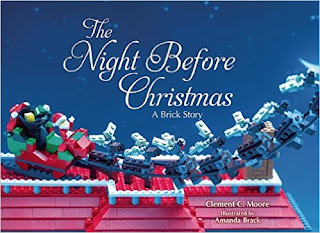 My kids absolutely love that The Night Before Christmas by Clement C. Moore contains LEGO brick scenes. We love LEGOS in our house so anything LEGO is usually a hit but I have to say I love the tie in with Christmas because LEGOS are always on my kid's holiday wish lists. On each page there's a Christmas scene to remind kids of the upcoming holiday season. This is a terrific book to add to your child's holiday reading collection! You can find The Night Before Christmas by Clement C. Moore on Amazon, Barnes and Noble and other bookstores.